The 51st Fighter Wing initially flew the F-80C in the Korean War, but in 1951, the 51st brought in high-scoring World War 2 ace Colonel Francis Gabreski to assume command when it converted from the F-80 over to the newly arrived F-86E. His recruits included his elite 4th Wing pilots, and by the end of the war, the 51st had two pilots who achieved the status of Double Ace as well as the highest s… coring ace of the war, Joe McConnell. 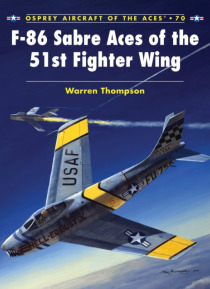 This book describes the 51st Wing's tenure with the Sabre that led to their high scoring sprees of 1953.